to buy 5 kg of meat, 50 kg of beans, 50 kg of potatoes, and 20 liters of Rina vegetable oil, etc. Israel Group benötigte 4175 US-Dollar, um ein Gewerbe im Bereich Nahrungsmittel auf- oder auszubauen. Das Geld wurde gesammelt und für Israel Group bereitgestellt. Henriette is a client with Hekima and is the leader of the borrowing group "Israel". She is an entrepreneur and runs a neighborhood restaurant. She began her business twenty years ago with her own funds resulting from a tontine. 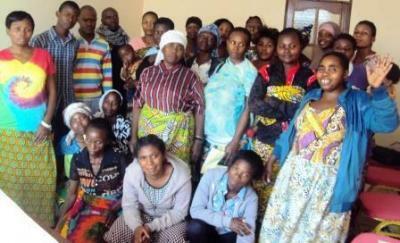 In 2013, she received a loan from Hekima to increase her financial capital. Henriette is the mother of 8 children who all attend school. With this new loan, she will buy 5 kg of meat, 50 kg of beans, 50 kg of potatoes, and 20 liters of Rina vegetable oil, etc. She thanks Hekima and the lenders for financing small entrepreneurs without access to banking loans. It should be noted that one client is pictured holding her child.